← What Kind Of Legacy Do I Want to Leave? I am grateful for my spiritual upbringing. Going to church was a consistent part of my life and I loved going. I never had the desire to quit. Part of my spiritual life included being in a girls’ group within the church that emphasized scripture memory. Some of those verses were the 23rd Psalm. That Psalm must have embedded itself in me during those years between 10 and 12 because at age 12 tragedy came into my life. My sister and I were spending the weekend at my grandparent’s home. We adored them and loved going to their house that was in a rural area. The Friday evening after we arrived, my grandparents took us into town to visit other family members. One the way home a fence was down and black angus cows were in the middle of the road. Because it was dark it was difficult for my grandfather who was driving to see them so we ran into them. My grandfather, grandmother, and 5 year old sister were thrown out of the front seat. The car then spun many times and Grandmother was killed almost instantly. There were no scratches on the other two. I was in the back seat and those doors did not fling open, like the front ones, so I was physically safe. The ambulance came. We all went to the hospital. There in the waiting room was a Gideon Bible. 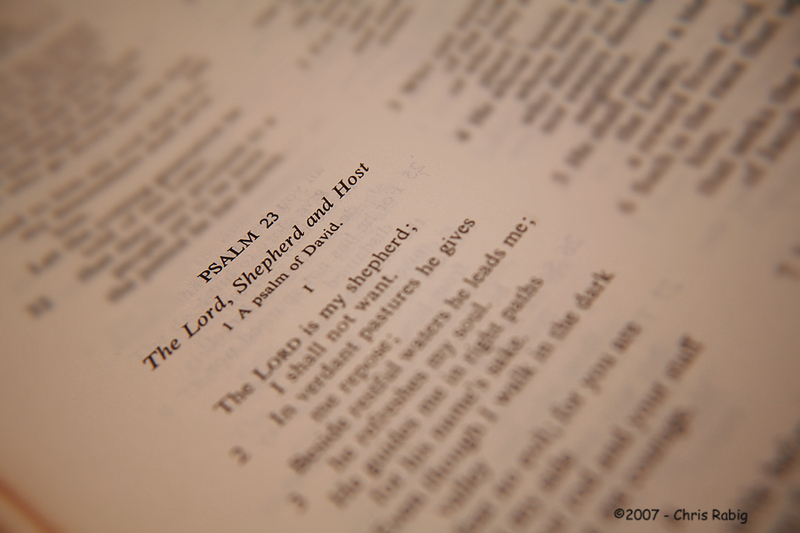 I knew exactly where to turn since Psalm 23 had been one of the portions of scripture I had memorized. There in those scriptures I found comfort in my sorrow. There was a peace that flooded my soul and stayed with me for years to come even when awful images popped into my mind. You see, the car ran over Grandmother. I saw her in her last moments struggling as she took her last breath. I know severe emotional trauma could have followed, but God’s presence and the presence of His Word in my life was what helped sustain me in the days that followed. There was also a peace that passes all understanding that came because I knew Grandmother had put her faith and trust in Jesus Christ and that she was home in heaven with Him. That accident happened 47 years ago. I continue being amazed at the rewards and benefits that come from having God’s Word embedded in my heart. Storms still come into my life. One of the ways I’m able to walk through them without drowning in despair is spending time reading God’s Word and meditating on those verses that bring comfort and hope. The Word of God over and over lets me know how much God loves me and cares for me. That’s the foundation that keeps me strong and lets me know I’m safe no matter what comes my way. Thank you Kristi for sharing that…I had no idea. It took courage to overcome that and courage to share it through your blog. God’s Word is indeed an anchor that keeps us grounded while giving us hope for tomorrow.